I am a firm believer that ‘healthy eating’ begins and ends with having a healthy relationship with food. Our society tends to moralise food, weight and exercise which can lead to a range of complicated (mainly negative) attitudes towards the food we eat and how we feel about our bodies. I will not discuss ‘good’ or ‘bad’ foods, nor will I talk to you about weight loss. 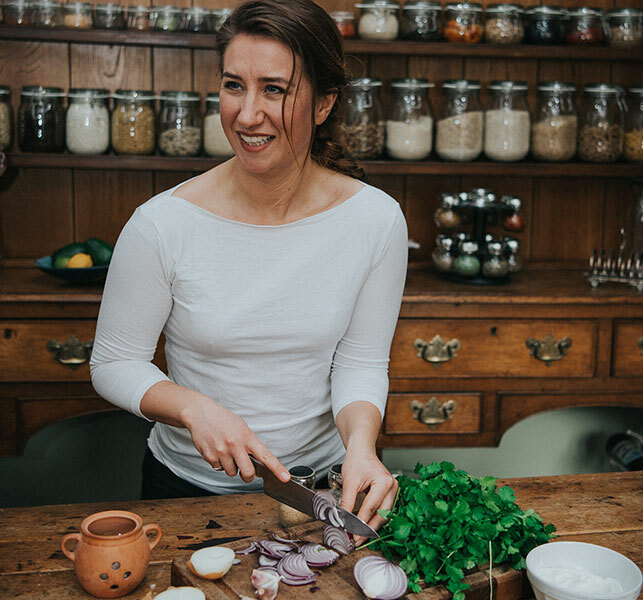 I hold cookery demonstrations and nutrition talks that touch on the principles of intuitive eating and teach you how to prepare and cook delicious meals. I also work one on one with clients to help them grow their cooking and eating habits with an aim to develop a positive and healthy relationship with food. So, if you are looking to go on a diet, I am not the consultant for you. If you are looking to change the way you think about your diet (i.e. the food you eat) and to learn about nutrition in a positive way, then get in touch. Starting this Spring, I will host monthly cookery and nutrition evenings in my outdoor Tipi kitchen At The Farm. Each evening will be on a different theme covering a variety of concepts and diets. You will be able to learn a bit about the science behind your food, whilst learning how to prepare and cook it. These demonstration will be as interactive as possible so that you are able to learn new techniques and get a good understanding of how to prepare the dishes shown. Evenings start at 1900 in the Tipi, At The Farm on Collins Farm, Frilford, OX13 5NX. The price includes all the lovely food prepared and served throughout the evening with wine to pair (non-alcoholic drinks also available). These evenings are suitable for anyone (16 or over) who is interested in learning more about cooking and nutrition, no matter your level of experience. Like what you see? You can book your place for online today one of our Tipi Kitchen Nutrition Evenings! Bespoke packages combining nutrition as well as personal training and fitness classes can be created to suit your requirements.